Facial movements such as frowning or squinting can create frown lines. Frown lines can develop in all age groups including some younger adults. Very similar to BOTOX® Cosmetic, BAXT CosMedical® offers Dysport® as an alternative wrinkle relaxer approved to treat forehead wrinkles and frown lines. The FDA has approved Dysport® to treat moderate to severe frown lines in adult patients less than 65 years of age. Trust your Dysport® injections only with a Board Certified Dermatologist! Dysport® is best performed by board certified dermatologists who are experienced, appropriately certified injectors. Dr. Rebecca Baxt and Dr. Saida Baxt are Board Certified Dermatologists who have performed thousands of BOTOX® Cosmetic and Dysport® injections and can help determine the best treatment for your skin and facial renewal goals. A clinical study in JAMA Dermatology found that BOTOX® Cosmetic and filler procedures are very safe when performed by experienced board-certified dermatologists. Side effects occurred in less than one percent of recipients, and most of these were minor; such as, minor headache or bruising. Beware of low cost “injectables” as there is no “generic” form of BOTOX® Cosmetic, Dysport® or Xeomin®. The formulations, potency, and approved doses vary among botulinum toxin products. This means that one product cannot take the place of another. There’s only one FDA-approved Dysport® so be sure you are getting authentic Dysport®. We receive our Dysport® directly from the manufacturer, Galderma. There is a lot of artistic vision to injecting Dysport®. You want a very experienced and properly trained injector, not someone who takes a weekend course, or injects in a salon, gym, or in homes. Dysport® is an FDA-approved drug and is a medical procedure best performed by a licensed board certified dermatologist with expertise in the art of cosmetic medicine and NOT a nurse, physician’s assistant (PA), dentist or other type of non-cosmetic doctor. Dysport® is an injectable form of botulinum toxin Type A similar to the active ingredient in BOTOX® Cosmetic. Dysport® works by blocking the nerve impulses that cause your facial muscles to contract and form lines. The main ingredient in Dysport® is a neurotoxin, but the amount is so incredibly small that it’s considered non-toxic. Dysport® works by relaxing facial muscles and allows unsightly lines and wrinkles to flatten out giving you a younger more rested look. When applied by a Board Certified Dermatologists in appropriate amounts, Dysport® is a safe medication (cosmetic injectable) used for the temporary improvement in the appearance of moderate to severe glabellar lines. It was FDA-approved for cosmetic use in 2007. What Areas are Commonly Treated With Dysport®? The common area of injection is between the eyebrows where women and men frequently develop a furrow or indentation in their forehead. This area responds very well to Dysport® injections in smoothing out the furrow. Dysport® is effective in temporarily lessening the appearance of facial wrinkles, including crow’s feet and forehead lines. Dr. Rebecca Baxt or Dr. Saida Baxt perform all Dysport® injections. The procedure is quick and it is done in the office with only slight discomfort. * The potential side effects of Dysport® are similar to BOTOX® Cosmetic. They include local numbness, swelling, bruising or a burning sensation during injection. Placing ice on the injection site before and after the procedure can reduce side effects. If there is a bruise, you will usually be able to use a concealer to minimize it. We recommend “taking it easy” for the rest of the day after Dysport® i.e. no gym, working out, kickboxing, yoga, spin etc. How Long Do Dysport® Results Last? 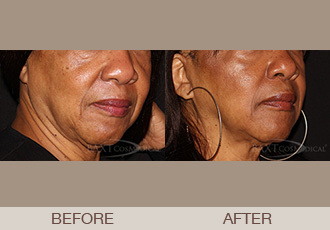 At BAXT CosMedical® we offer Dysport® injections for the non-surgical treatment of facial wrinkles. Let Dr. Rebecca Baxt and Dr. Saida Baxt help you determine if Dysport® is the right treatment option for you based on the condition of your skin and your personal goals. There are other alternatives (BOTOX® Cosmetic and Xeomin®) that our physicians are happy to discuss with you. Dr. Rebecca Baxt and Dr. Saida Baxt participate in the Aspire Galderma Rewards program. Galderma’s Aspire Rewards program rewards patients for using Galderma cosmetic products. It’s free to join and earn points on Dysport®, the Restylane® collection of products, and Sculptra® Aesthetics at BAXT CosMedical®. Why would you trust your face to anyone else? For Unmatched Expert Non-Surgical Facial Rejuvenation with Dysport®, Contact Us Today! *Results may vary on different patients and are not guaranteed. There are other alternatives (BOTOX® Cosmetic and Xeomin®) that our physicians are happy to discuss with you.